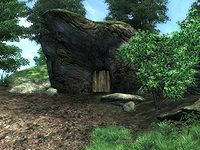 Mingo Cave is a small cave between the Imperial City and Bravil containing monsters. It contains only one zone, Mingo Cave. This cave contains 27 Cairn Bolete plants and 37 Wisp Stalk plants. This location's map marker (M on map) is named Mingo Cave (editor name MingoCaveMapMarker). The entrance door is N of the marker, 80 feet away. 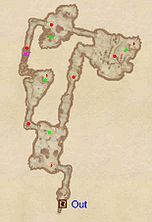 This is a small and fairly linear cave to explore. Upon entering from door Out, you will immediately stumble upon a pile of bones and an iron helmet and iron shield. 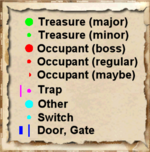 When you reach the first room, you have two routes to choose from; going left will lead you into a small room with one chest. The rest of the cave can only be accessed from taking the right entrance. That area contains a few enemies and chests and an easy-to-avoid Cave In trap located in the narrow hallway at the very end of the final tunnel (purple dot on map).